A Word or Two: Halloween Fun! Laura had a busy week of costumes, candy and trick-or-treating! On Sunday we went to the Fall Festival at our church. 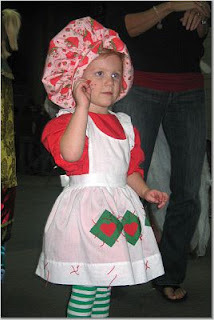 Our little Strawberry Shortcake enjoyed the games and indoor trick-or-treating. 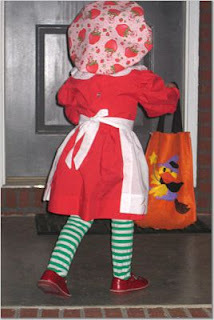 On Tuesday she dressed up as a nurse for the community-helper costume day at school. Unfortunately, our camera is being ornery and we didn't get a picture of that outfit! Take my word, she was a cute nurse. 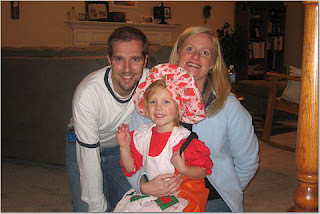 Last night we ate dinner with some friends from church and enjoyed a night of trick-or-treating. Laura had a blast with her friends Mackenzie and Josiah. The girls were adorable in their costumes, and Josiah (16-month old) did his best to keep up with short little legs as we went up and down the streets. It was a fun evening! I just fell in love with my niece all over again. She is SO CUTE! I'm glad you all had a great time. Sara, you guys got some GREAT pictures! Laura made an adorable Strawberry Shortcake. We really had a wonderful time with you guys. I am trying to treasure all the memories and make as many more as possible before this summer...I don't like to think about what our Halloween will be like next year without you guys. :( We love ya'll! Thanks for a fun time. She is so cute! We are in to Strawberry Shortcake at our house too. So cute! Great costume! It's good to see everyone looking so happy! Okay, girl...did you make this costume? 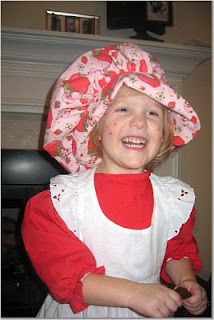 It is so very cute...Grace wants to be Strawberry Shortcake for next year now that she has seen your pictures....nothing like a little early planning! Glad that ya'll are having such a fun time with friends there in Knoxville. Our family (the James) still looks back at our time from grad school with VERY fond memories...great friends, great times! So cute. What a great costume. Looks like lots of fun was had by all! Laura looks really cute!!! Sounds like you guys had fun this year! Just think next year you will have two to dress up! Very cute Strawberry Shortcake. Looks like Laura had too much fun! Laura has gotten so big! She also looked so adorable for Halloween. Enjoy all those great times in Knoxville and hope it won't be too hard to come back "home"...It was hard for me to re-adjust to Searcy after Tallahasse. But it gets better with some time, just know it will be different for a while.